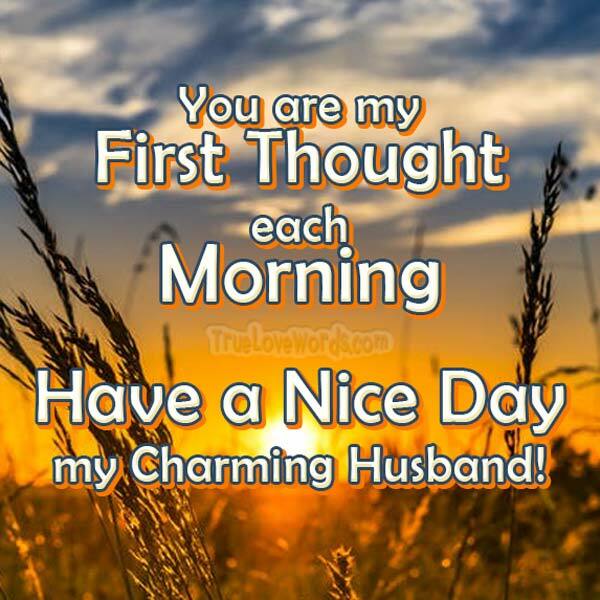 Make your husband a little surprise and send him a romantic good morning message. It can give him a big boost to face the everyday difficulties, knowing that you are thinking of him. 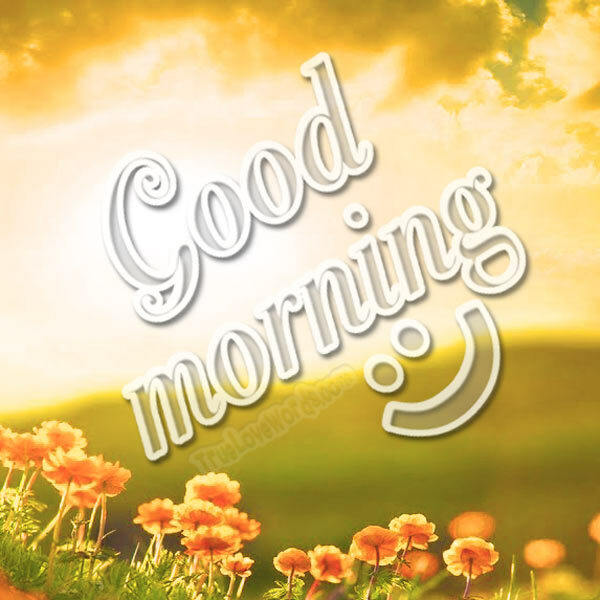 Just one good morning message from you, can make him happy and his day beautiful. Pick the one you like from the unique list below and send it right away! Enjoy and may you have beautiful morning! 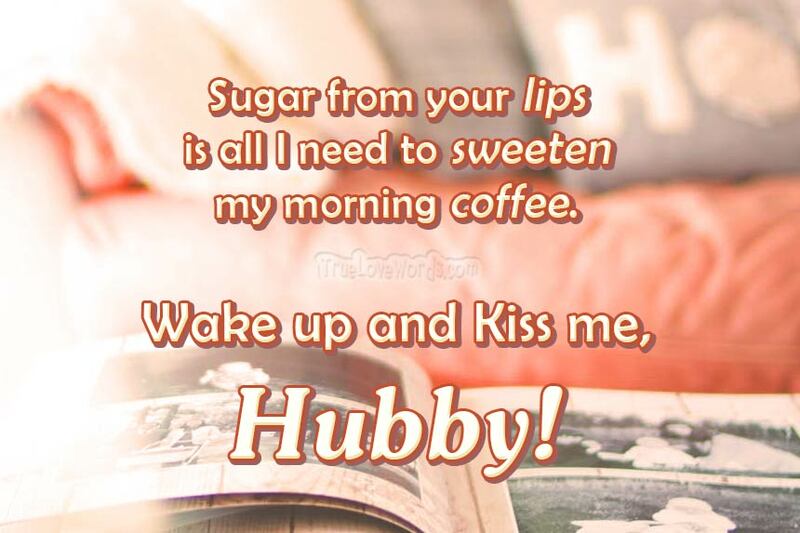 ♦ Sugar from your lips is all I need to sweeten my morning coffee. Wake up and kiss me, hubby. ♦ You are all I’ve ever wanted in a husband, and I am blessed to wake up beside you each day. ♦ My dear husband, you set my heart ablaze each morning when your eyes open and capture me anew. Good morning! ♦ I will wake up by your side, walk beside you daily, and lie next to you each night. You are the man who makes my life complete. ♦ I love growing old with you morning by morning, one heartbeat at a time. You are my precious husband, soulmate, and friend. ♦ Here’s wishing you a 5-star day, hubby! ♦ My dear husband, you’ll never know how secure I feel waking up in your arms each morning. Thank you for loving me with all your soul and strength. Good morning my charming man! ♦ I love a new day because it is a chance to adore you for 24 more hours. My heart will always beat for you, my husband. ♦ Babe, your lips take me to heaven. I long for your good morning kiss every day. Good morning my hubby! ♦ Your morning kisses give me the energy to start the day. I love you, sweet husband. ♦ I love how you fill out those flannels! Let’s snuggle for a while, hubby. ♦ The refuge of your love quiets my nights and calms my days. Thank you for blessing me with the kind of strength only a strong husband can provide. ♦ My whole day is complete the moment you wake up and smile. Your love is fantastic, my husband. ♦ Babe, your good morning smile melts away my every worry and fear. ♦ I’m sorry for stealing all of the blankets last night. Let me wrap myself around your lovely body to warm you up. I can’t have a cold husband. ♦ The day may be cold and gray, but waking up next to you and seeing your handsome face is golden sunshine. ♦ My dear hubby, I thought about making you breakfast in bed, but I decided to cuddle in bed is more fun. ♦ Each morning I am amazed that I ended up with such a handsome, loving husband. Here’s wishing you the best day ever. ♦ The circumstances that brought us together as husband and wife were initiated by God Himself. Waking with you is a blessing I cherish each day. ♦ A warm, slow kiss equals morning bliss. A robust and tight hug makes me sheltered and snug. Good morning my sweet husband. My protector while I sleep. And my safe place every day. ♦ I love how you compliment me with your eyes every morning, sweet husband. ♦ When I see you each morning, my handsome man, my heart melts faster than the butter on my pancakes. ♦ Life is worthwhile because of your smile. I long to see it each morning, dear husband. ♦ Waking up as your wife brings joy to my life, and each day is a blessing because of you. ♦ Hubby, you make even the gloomiest day bright. Good morning! ♦ Waking in the still silence of the first morning rays and speaking only through our eyes is one of the best parts of each day. You are an amazing husband. ♦ Entwined in your arms, not resisting your charms, I love waking with you, dear hubby. ♦ Your love is a lifetime supply. Thank you for delivering each morning, my dear husband. ♦ It’s another great morning. Time to indulge me with your manly charms and rugged good looks so that I can have a fantastic day. ♦ My dear husband, I love waking up next to you, seeing you wearing nothing but a smile. ♦ From dawn to dusk and dusk to dawn, my love for you will carry on. You are the greatest husband a girl could ever hope to have. ♦ Your sleepy smile and morning kiss are two things I must never miss. Have a wonderful day, hubby. ♦ I love your cute little husbandly quirks, and how each morning of marriage comes with its perks. Good morning sweetie! ♦ If love is a featherbed, then sink with me into its depths, and let’s stay right here all day. ♦ You are my first thought each morning, the man of my dreams, the amazing reality of my day. Good morning my charming husband! ♦ My good morning to-do list: Wake up, look at you, swoon, thank God for giving me the perfect husband. ♦ To wake with you, what’s a girl to do? Your lips entice, such paradise! ♦ Hubby, your kiss is warm, your chin is stubbly. You’re a morning person, bright and bubbly. ♦ I’m the toast, and you’re the jam. Slather your love on me this morning, Babe. ♦ The power of your love is stronger than the pull of the sun’s rays when it comes to waking me for another day. You’re the husband I’ve longed for. ♦ Breakfast may be the most important meal of the day, but I’d instead feast on your kisses this morning, gorgeous guy. ♦ My favorite morning habit is kissing your bold lips and seeing your eyes light up. Good morning hubby! ♦ Coffee beans, t-shirt, and jeans, sitting here looking at our screens. But I wouldn’t want to spend my morning with anyone but you, hubby. ♦ This pic will make you laugh, and this coffee will make you pee, but the best part of your morning is spending it with me! Right, hubby? ♦ Babe, I packed your lunch with kisses, and I ironed your shirt with love. Here’s wishing you a beautiful day with last night’s memories to think of. I’m wishing you safe travels as you go. so that I can kiss you nice and slow. ♦ Babe, your sexiness is overwhelming this morning. Good morning my charming man! ♦ I hope your dreams were sweet and your pancakes are sweeter, but most of all I hope you enjoy this sweetest kiss from your loving wife. Good morning love! ♦ The sunrise reminds me of you: bright, warm, colorful, and a fantastic gift from God. Have a perfect day, dear husband. ♦ It’s cold this morning. I need your warm hands all over my body. Think you can help your wife out? ♦ Sweet husband, there are blessings in this day. Go out there and find them. Good Morning!